La Soufrière (Vincentian Creole: Soufray) ("The Sulfurer") or Soufrière Saint Vincent is an active volcano on the island of Saint Vincent in the Windward Islands of the Caribbean. Many volcanoes in the Caribbean are named Soufrière (French: "sulphur outlet"). These include Soufrière Hills on Montserrat and La Grande Soufrière on Guadeloupe, the subject of Werner Herzog's 1977 film La Soufrière . At 1,234 m (4,049 ft), La Soufrière is the highest peak on Saint Vincent as well as the highest point in the island country of Saint Vincent and the Grenadines. Soufrière is a stratovolcano with a crater lake and is the island's youngest and northernmost volcano. La Soufrière violently erupted in 1718, 1812, 1902, 1971, and 1979. The Saint Vincent eruption of 6 May 1902, just hours before the eruption of Mount Pelée on Martinique, killed 1,680 people. The death zone, where almost all persons were killed, was close to entirely Carib. This last large remnant of Carib culture was destroyed,  the island of Dominica's Carib Territory being much smaller in comparison at that time. Mount Pelée is a volcano at the northern end of Martinique, an island and French overseas department in the Lesser Antilles island arc of the Caribbean. Its volcanic cone is composed of stratified layers of hardened ash and solidified lava. The volcano is currently in a quiescent state, which means it is not active, but still registering minor activity. Joseph Mallord William Turner, known as J. M. W. Turner and contemporarily as William Turner, was an English Romantic painter, printmaker and watercolourist. He is known for his expressive colourisations, imaginative landscapes and turbulent, often violent marine paintings. The Victoria Gallery & Museum (VG&M) is an art gallery and museum run by the University of Liverpool in Liverpool, Merseyside, England. Montserrat is a British Overseas Territory (BOT) in the Caribbean. The island in the Leeward Islands, which is part of the chain known as the Lesser Antilles, in the West Indies. Montserrat measures approximately 16 km (10 mi) in length and 11 km (7 mi) in width, with approximately 40 km (25 mi) of coastline. Montserrat is nicknamed "The Emerald Isle of the Caribbean" both for its resemblance to coastal Ireland and for the Irish ancestry of many of its inhabitants. Saint Lucia is a sovereign island country in the West Indies in the eastern Caribbean Sea on the boundary with the Atlantic Ocean. The island was previously called Iyonola, the name given to the island by the native Amerindians and later, Hewanorra, the name given by the native Caribs. Part of the Lesser Antilles, it is located north/northeast of the island of Saint Vincent, northwest of Barbados and south of Martinique. It covers a land area of 617 km2 and reported a population of 165,595 in the 2010 census. Its capital is Castries. The Leeward Islands are a group of islands situated where the northeastern Caribbean Sea meets the western Atlantic Ocean. Starting with the Virgin Islands east of Puerto Rico, they extend southeast to Guadeloupe and its dependencies. In English, the term Leeward Islands refers to the northern islands of the Lesser Antilles chain. The more southerly part of this chain, starting with Dominica, is called the Windward Islands. Dominica was originally considered part of the Leeward Islands, but was transferred from the British Leeward Islands to the British Windward Islands in 1940. Black Caribs are an ethnic group native to the island of St. Vincent. Black Carib were historically referred to as zambos, since they are descendants of Island Caribs and enslaved Africans who mixed among themselves in the 18th century. This population retains Caribbean culture and makes up a very small population in the archipelago, representing the 2.0% of the current population of St. Vincent and Grenadines. There are also black Caribs in Dominica and Trinidad. The history of the Black Caribs is known due to reports that the British governor William Young sent to the British crown, in which he explained that the Black Caribs were a mix of Caribs and enslaved Africans from Spanish ships wrecked near its shores. These reports were read and taken as reference by many chroniclers and later historians. However, researchers of history and Garifuna language of the 20th and 21st centuries, such as Itarala, have their own conception of the origin of the Black Caribs. According to them, the African ancestors of the Black Caribs come from other Caribbean islands and migrated to Saint Vincent as refugees to escape slavery and as slaves bought by the Carib Amerindians. The Black Caribs are the people who originated the Garifuna people, when part of their community was expelled from St. Vincent in 1797 and exported to the island of Roatán, Honduras, from where they migrated to the coast of the mainland of Central America, spread as far as Belize and Nicaragua. The Soufrière Hills volcano is an active, complex stratovolcano with many lava domes forming its summit on the Caribbean island of Montserrat. Many volcanoes in the Caribbean are named Soufrière. These include La Soufrière or Soufrière Saint Vincent on the island of Saint Vincent and La Grande Soufrière on Guadeloupe. After a long period of dormancy, the Soufrière Hills volcano became active in 1995 and has continued to erupt ever since. Its eruptions have rendered more than half of Montserrat uninhabitable, destroying the capital city, Plymouth, and causing widespread evacuations: about two thirds of the population have left the island. La Grande Soufrière,, is an active stratovolcano on the French island of Basse-Terre, in Guadeloupe. It is the highest mountain peak in the Lesser Antilles, and rises 1,467 m high. Chateaubelair is a large fishing village on the Leeward (west) coast of the Caribbean island of Saint Vincent, the main island of Saint Vincent and the Grenadines. It is located just south of the volcano of Soufrière. Commonly referred to as just "Chateau", it is the focus and largest community in the North Leeward constituency of St. Vincent, and the fourth largest town in the country. 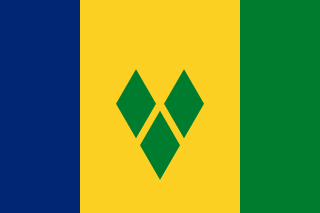 Vincentians or Vincentians, are residents of Saint Vincent and the Grenadines whose ancestry lies within Africa, especially West Africa. Most Vincentians are the descendants of African people brought to the island as slaves to work on plantations. This Saint Vincent and the Grenadines location article is a stub. You can help Wikipedia by expanding it.